The projects 'Areal at Walkenweg, Basel' and 'Areal Guggach III, Zurich' by Luca Selva Architects are part of the new issue of Hochparterre Wettbewerbe. 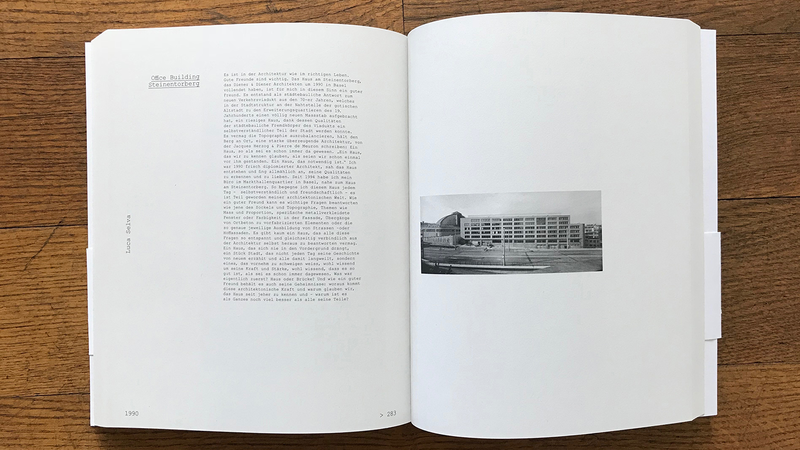 The Project Kaltbrunnen school is part of the book Bauten für die Bildung, published by Schwabe Verlag. The primary school Erlenmatt by Luca Selva Architects is published in the latest issue of Kunst & Architektur. The Project Primary School Erlenmatt is published in the publication of the Kunstkredit Basel-Stadt 2018. The Project Apartments in Widmi-Park, Lenzburg is part of the book House Tour: Views of the Unfurnished Interiors, published by Park Books in 2018. The Luca Selva Architecte are awarded by Hochparterre with the Silver Rabbit for their Primary School Erlenmatt in Basel. Luca Selva about the house on Steinentorberg in Basel, built by Diener & Diener Architects. A house is not a tree. The Ozeanuim-Poject is published on Europaconcorsi. Gigi Oeris temple for the FCB-Youth was topped out. Only the roof is missing. Great need for new housing. In the village - high on the hill. Where the young reach for the stars. Where the futur football-stars will be born. This is how the FCB-Campus will look like. The house in Lupsingen is shown in the 'best architects 11' award publication. The Houses in Binningen, in Lupsingen and in Witterswil are published online. Publication of the house in Lupsingen as the Jury winner and the house in Binningen for the nomination. Basel wins gold in Lupsingen. Nomination of the house in Binningen and the house in Lupsingen for the IdealesHEIM architecture price. The architect Luca Selva shows how to connect art and living. Publication about the house in Lupsingen in the russian magazine Interni.